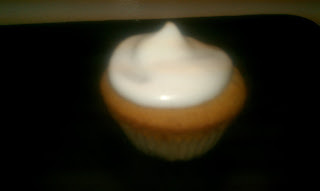 This week I have traded my cake sculpturing and such designs for some more interesting flavoured cupcakes. I love cupcakes! They are fun to make, and when placed on a decorative stand they just look wonderful. Everyone loves a cupcake. 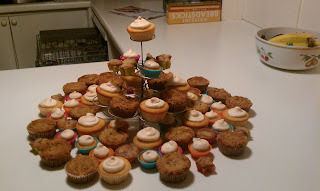 So for my other half's Mum's birthday cake, I thought I would do her some cupcakes. Not just any cupcake will do though, on no, my reputation would be at stake! So I decided I would make her cupcakes flavoured with two of her favourite desserts - Lemon Meringue Pie and Apple and Blackberry crumble. 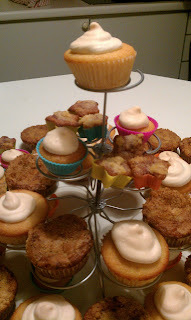 I used a basic cupcake mixture and adapted it to get the right flavours with the cakes. Then added bits and bobs to make these cupcakes resemble the original dessert it was being based around. Preheat the over to 180 centigrade, and line a tray with cupcake or muffin cases. Cream the butter and the sugar together in a large bowl or mixer. Sift in the flour and baking powder into the bowl and mix to incorporate. Scoop a large teaspoon of the mixture into your ready lined trays, then add a small dollop of lemon curd to the centre, cover with more cake mixture. place in the oven and bake for 15-17 minutes if you are using cupcake cases, and about 20 minutes if you are using muffin cases (until a skewer inserted into the middile of the cakes comes out clean). 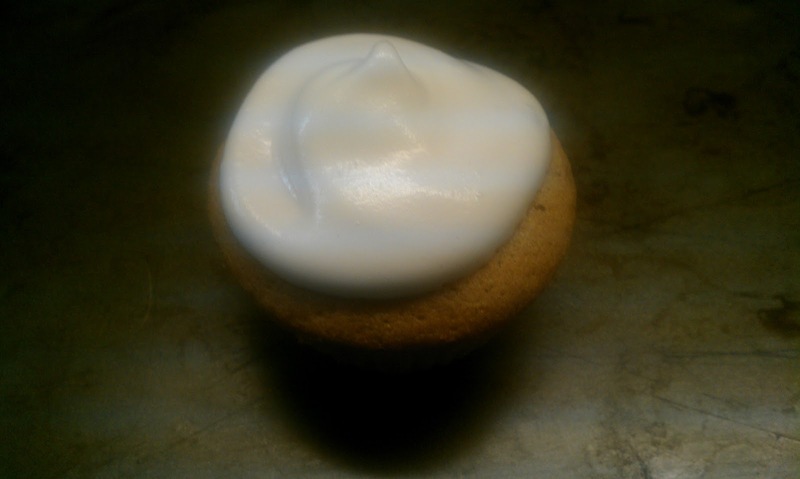 Allow the cakes to cool, so that when the meringue mixture is added, it doesn't move or melt from the heat. Once you have finished baking the cakes, turn the over down to 110 celsius. Whilst the cupcakes are cooling, whisk your egg whites in a clean bowl until forming stiff peaks, and the mixture does not move in the bowl when turned upside down. Add the sugar a little at a time, whisking a little in between each addition. Place in the over for 15 minutes to dry the meringue out and cook it mostly, then switch over to a high grill for approximately 2-3 minutes until the meringue is just starting to turn golden. Blitz the apple and blackberries in a food processor until they have been chopped finely. Cream the butter and sugar together in a large clean bowl. Add the eggs one at a time whisking in between each egg. Sift in the baking powder and flour and mix thoroughly. You may wish to add a little extra flour if you feel the mixture is too runny. Prepare the crumble topping in a separate bowl, by rubbing the butter into the flour and sugar until it resembles coarse bread crumbs. Add more flour to acheive this if neccessary. Spoon the cake mixture into the prepared cake cases. Then sprinkle a generous amount of crumble topping over each cake. Bake in preheated over for 25 minutes, they will remain a little soft because of the cooked apple and blackberries, but the crumble topping should be nicely golden brown. Place on a wire cooling rack to cool. These were a big hit and very much enjoyed by all, especially enjoyed as there were so very many of them! Yum yum yum cake!